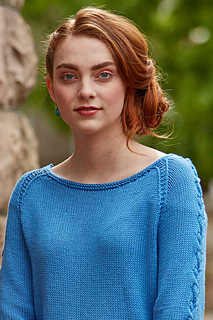 33 1/2 (37 1/2, 41 1/2, 4 51/2, 49 1/2)" bust circumference; shown in size 33 1/2"
The sleeves of this pullover are worked first back and forth from the lower edge to the underarm. The body is then worked in the round from the lower edge to the underarm. The back and back of sleeves and the front and front of sleeves are worked separately back and forth. 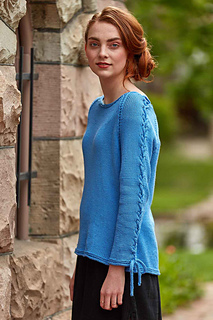 Light blue pullover shown measures 37.5”; modeled with 3” of positive ease. Yarn Valley Yarns Southwick (52% pima cotton, 48% bamboo viscose): #04 blue lapis, 9 (10, 11, 12, 14) balls. Yarn distributed by WEBS. Needles Size 5 (3.75 mm): 32” circular and two double-pointed. Adjust needle size if necessary to obtain the correct gauge.